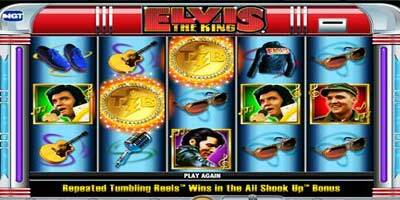 New IGT video slot released at Sky Vegas: Elvis the King. Try it with £10 free! This week, the Sky Vegas game launch consists of a fantastic new slot – Elvis The King. The brand is a huge hit in the land based world and game continues the recent line of big game titles from IGT. You can try it for free: Sky Vegas is offering £10 free (no deposit required). This Mystery Wild feature can earn you smokin' hot payouts on any base-game spin. This on-reels bonus can randomly trigger during any base game spin, turning one, two or all three of the centre reels fully wild. Get three Bonus symbols anywhere on the centre three reels to trigger the Jukebox Bonus Picker. Then pick a record to reveal which of the three bonuses you will play. You cannot collect chips after you have passed Level 4. Any collected chips are cleared at the end of the bonus. Lady Awards a prize and advances you to the next floor. ELVIS® Awards all prizes behind any unopened doors and advances you to the next floor. Broken Heart Awards a prize and breaks a heart. If you have any unbroken hearts remaining, pick another door on the same floor. The higher the floor, the higher the award potential. Advance to the 8th floor to earn the Jackpot award. The Heartbreak Hotel™ Bonus ends when you reach the top floor or have no unbroken hearts remaining. You get eight initial free spins in the All Shook Up™ Free Spins Bonus. Get three or more Bonus symbols anywhere on the reels to earn eight additional free spins (up to 128 total free spins). A scatter award is paid in addition to the bonus retrigger (see paytable for details). 2.Symbols in winning combinations disappear. 4.If new winning symbol combinations appear, wins are paid and the tumble feature repeats. Consecutive winning tumbles light up the ELVIS® sign one letter at a time. Non-winning outcomes reset the sign. Five or more consecutive winning tumbles light up the ELVIS® sign and award you the Jackpot. The Jackpot can be earned this way multiple times in the same bonus round. 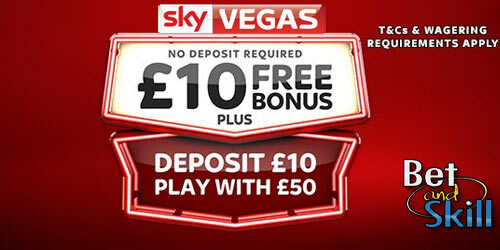 Open a new account with Sky Vegas and get £10 free no deposit required! "New IGT video slot released at Sky Vegas: Elvis the King. Try it with £10 free!"